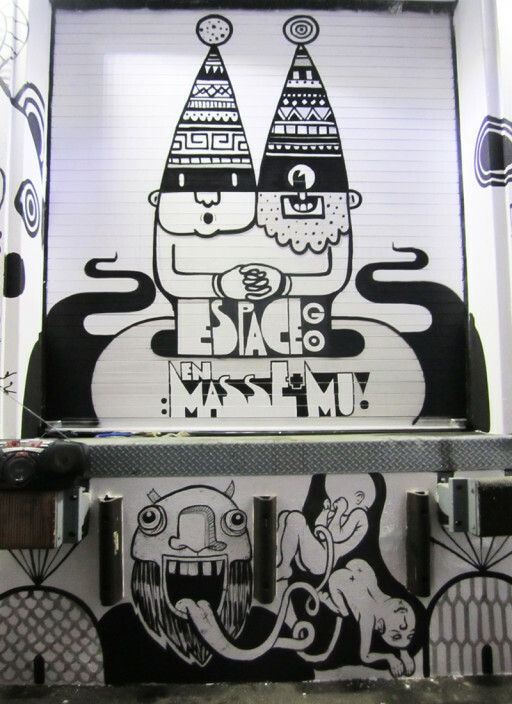 En Masse means “as a whole”, or “all together”. 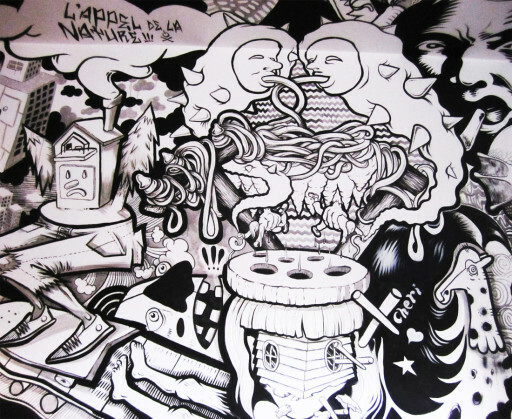 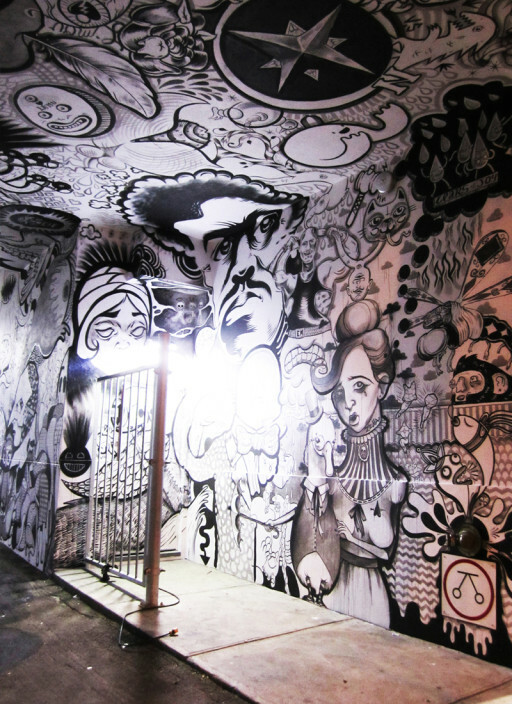 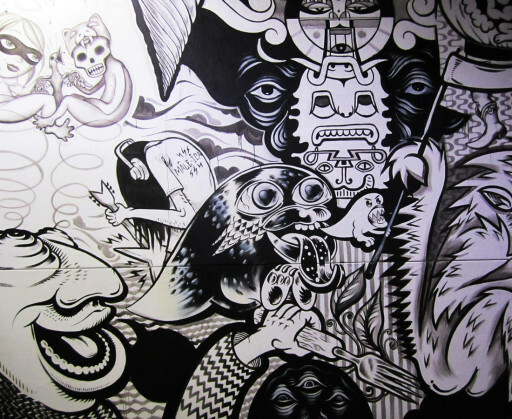 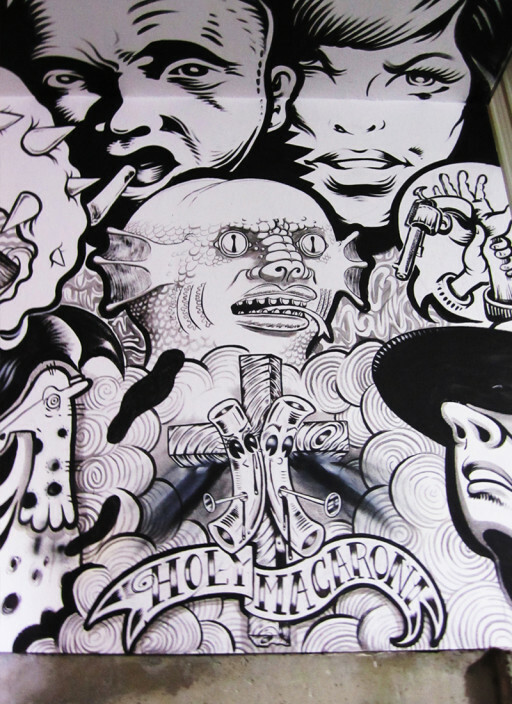 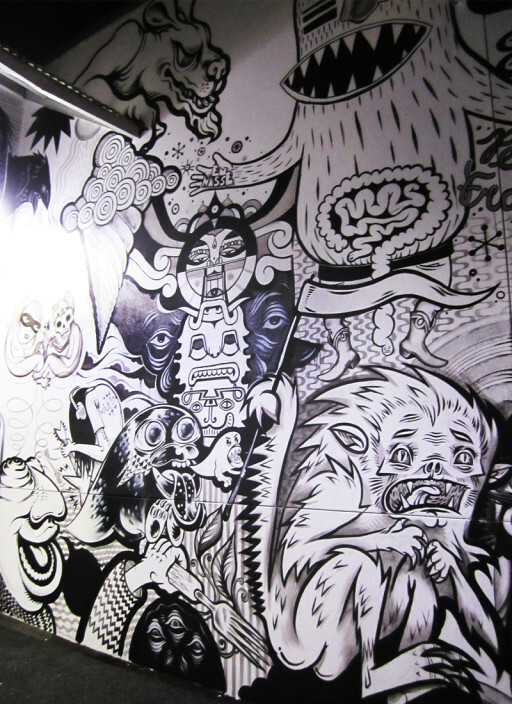 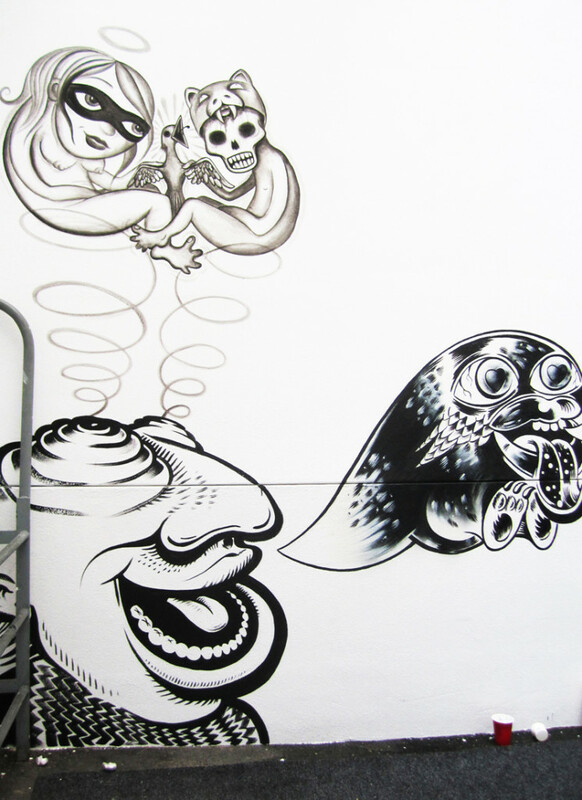 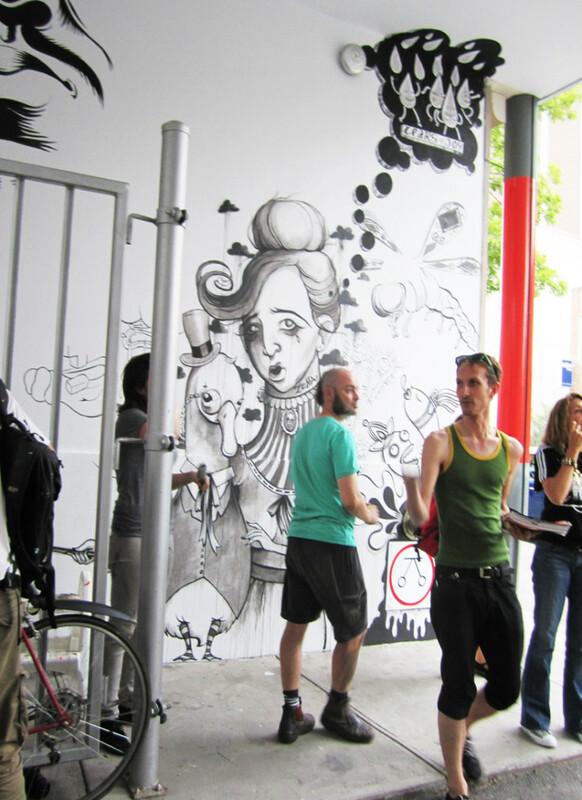 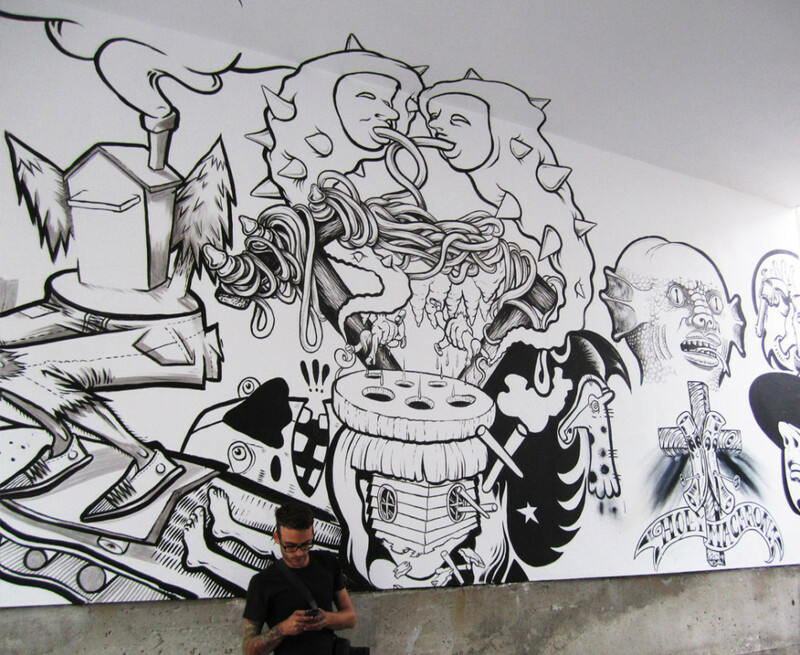 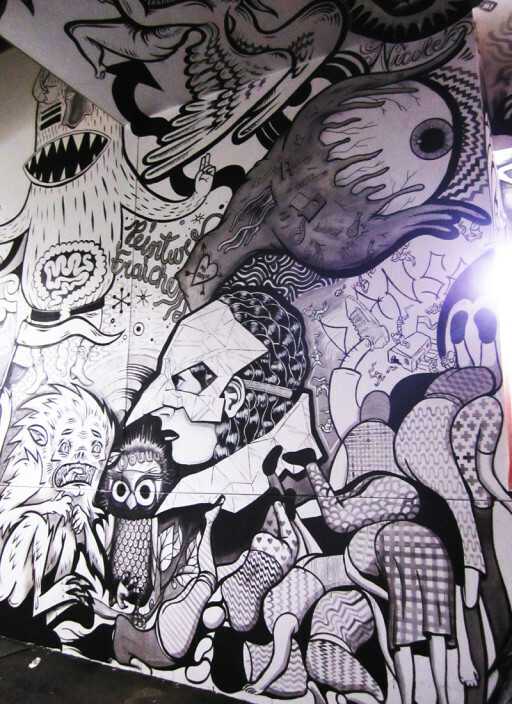 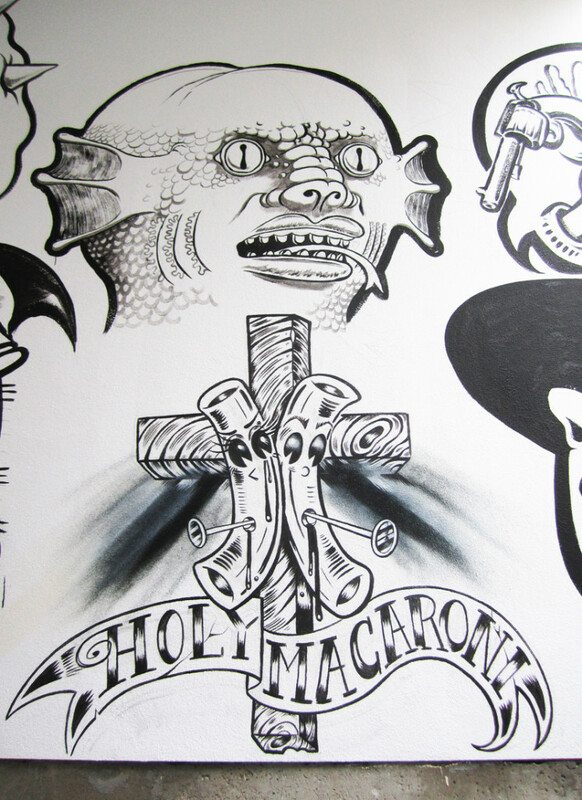 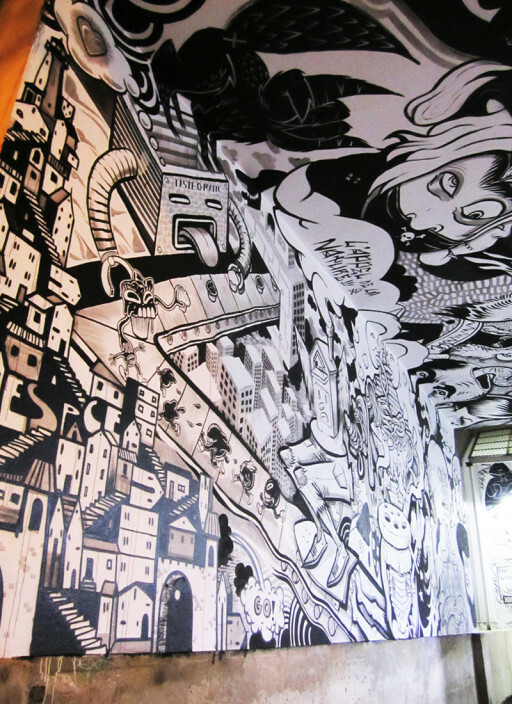 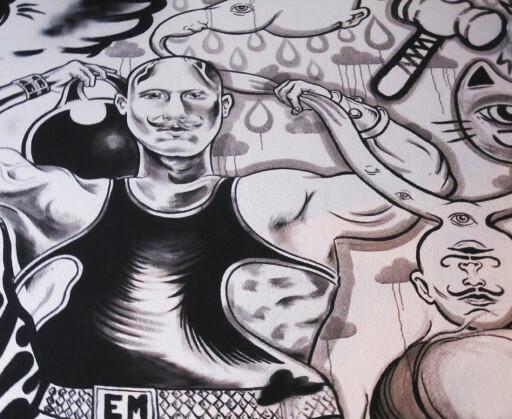 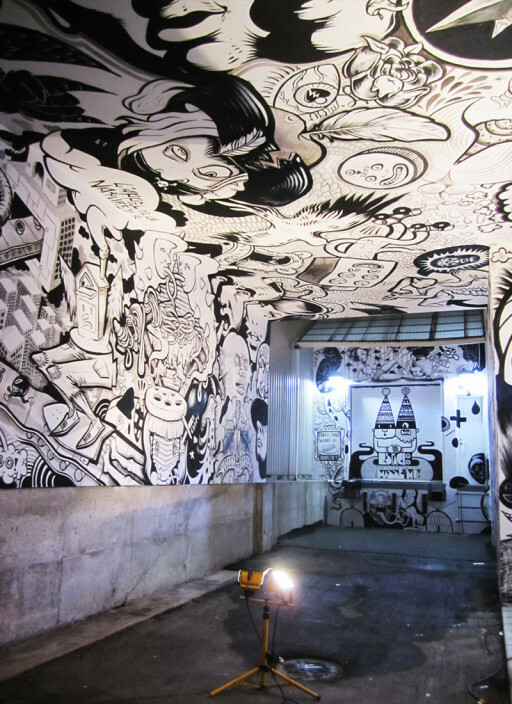 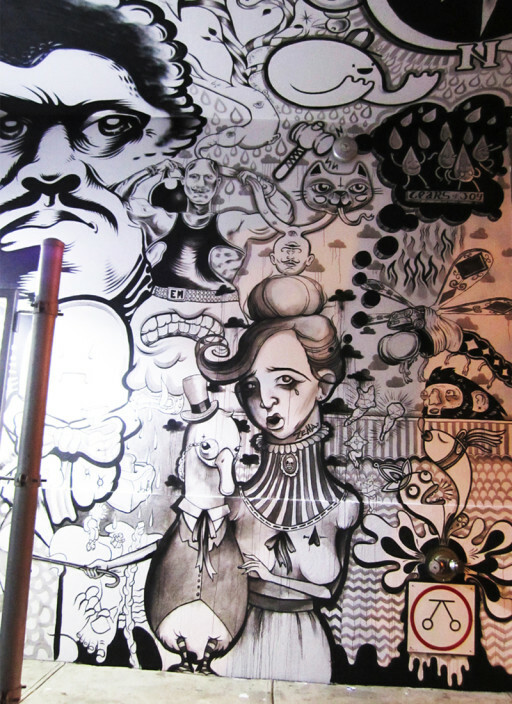 It is a Montreal based, multi-artist collaborative drawing project. 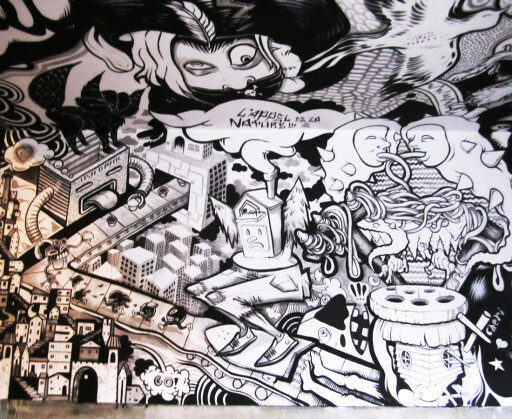 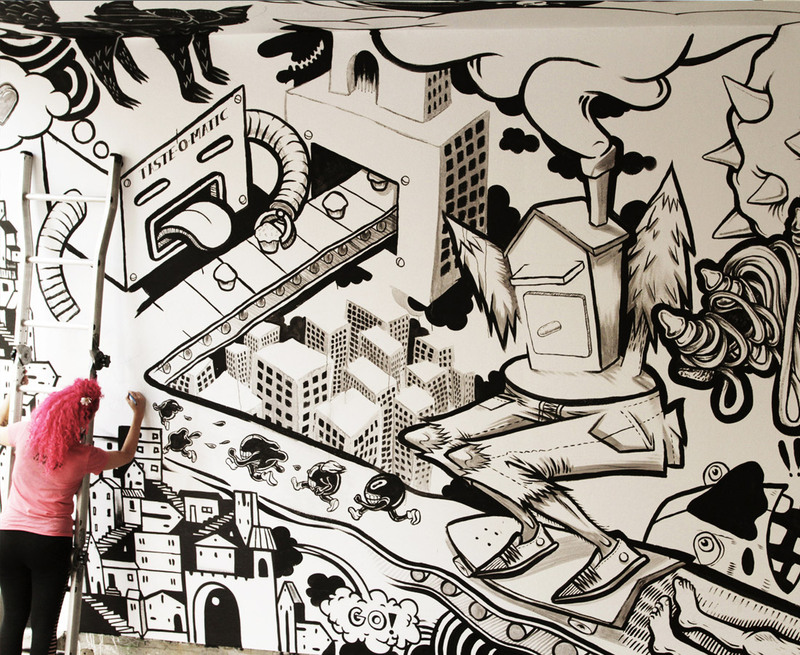 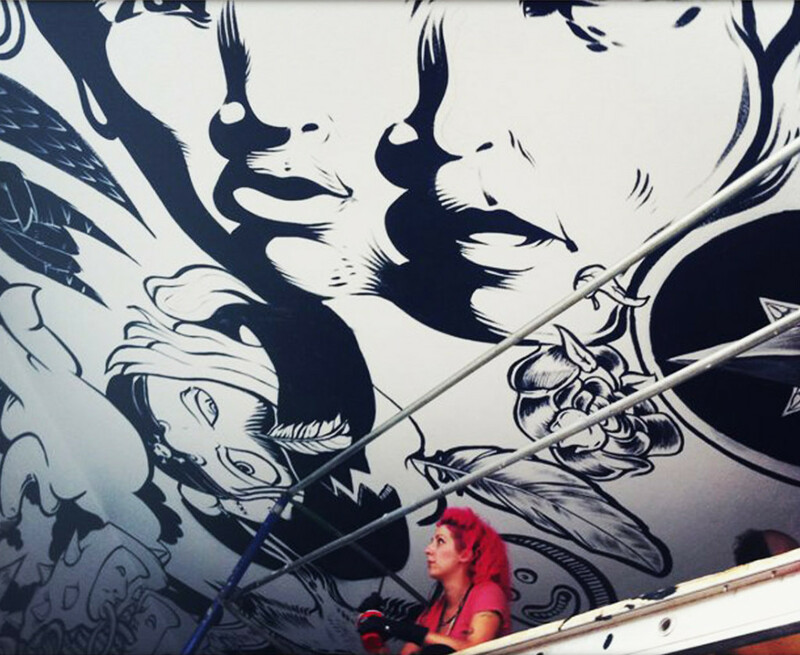 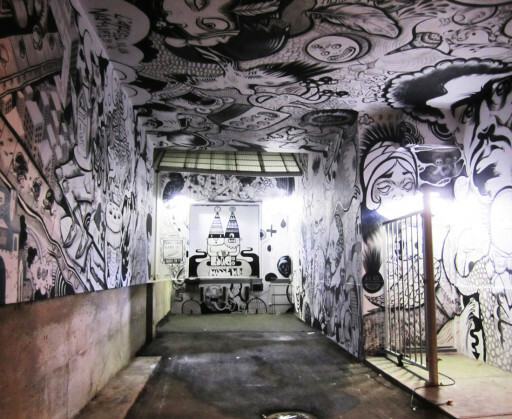 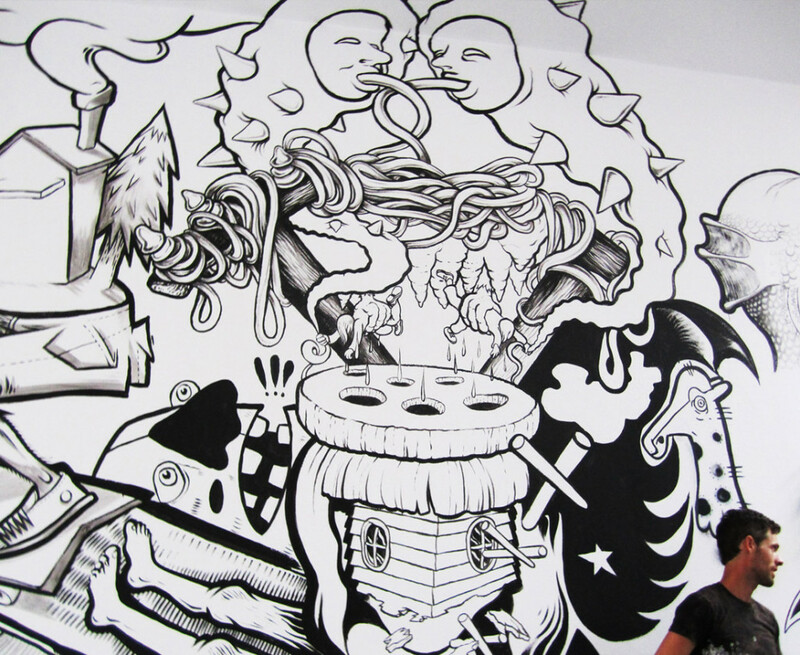 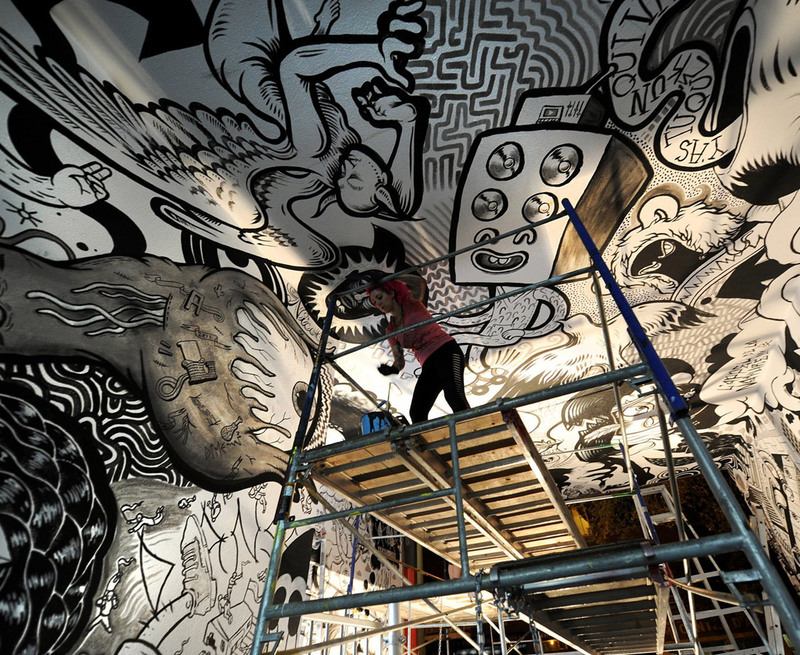 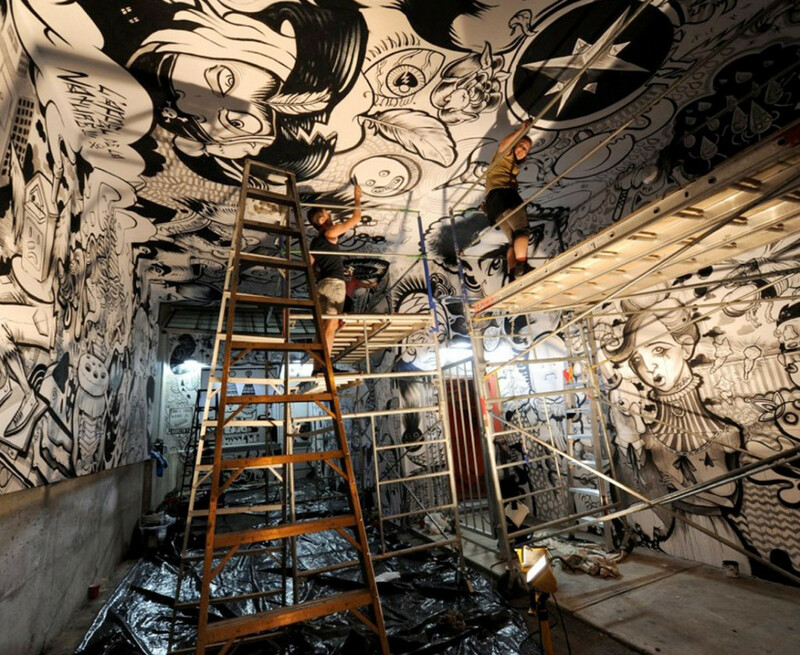 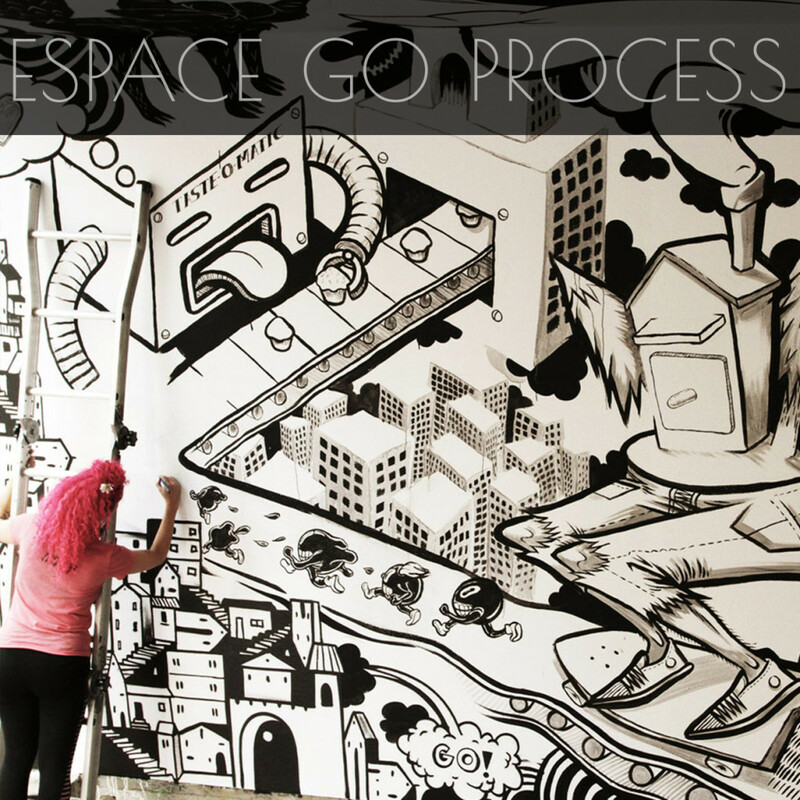 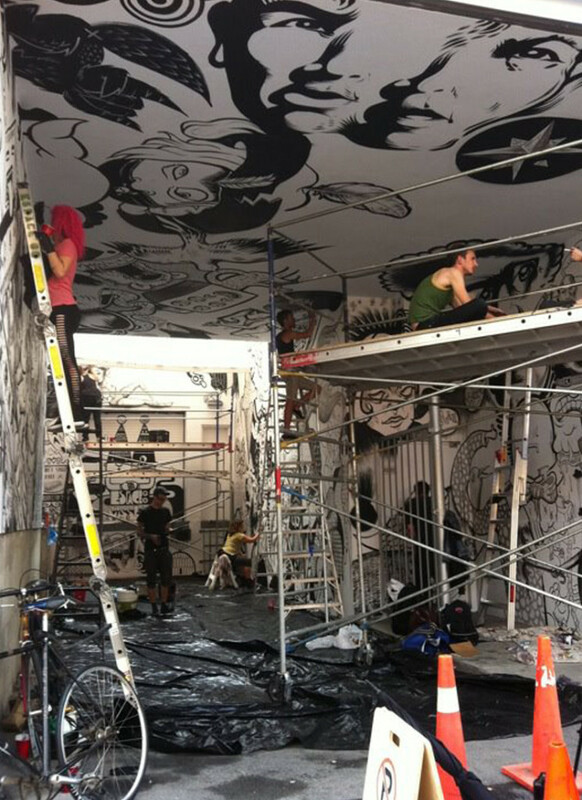 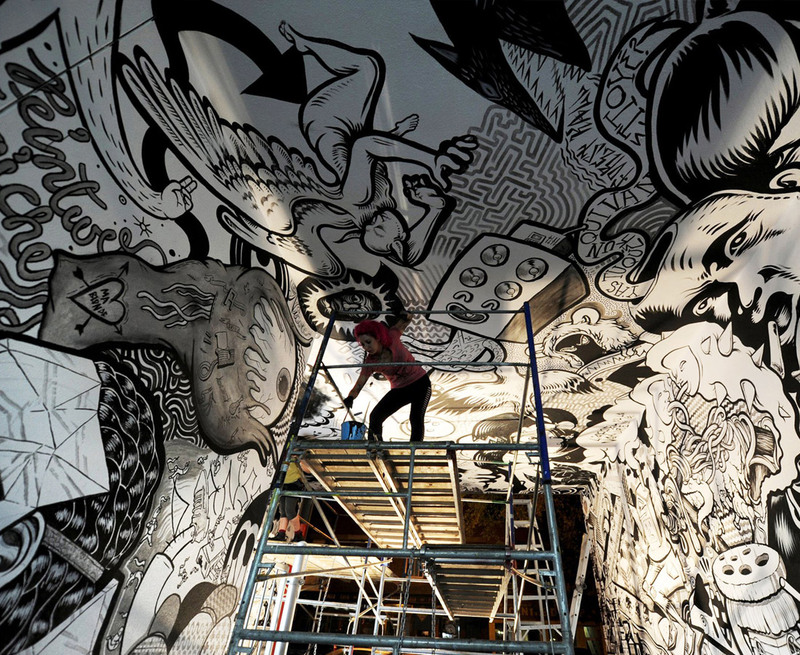 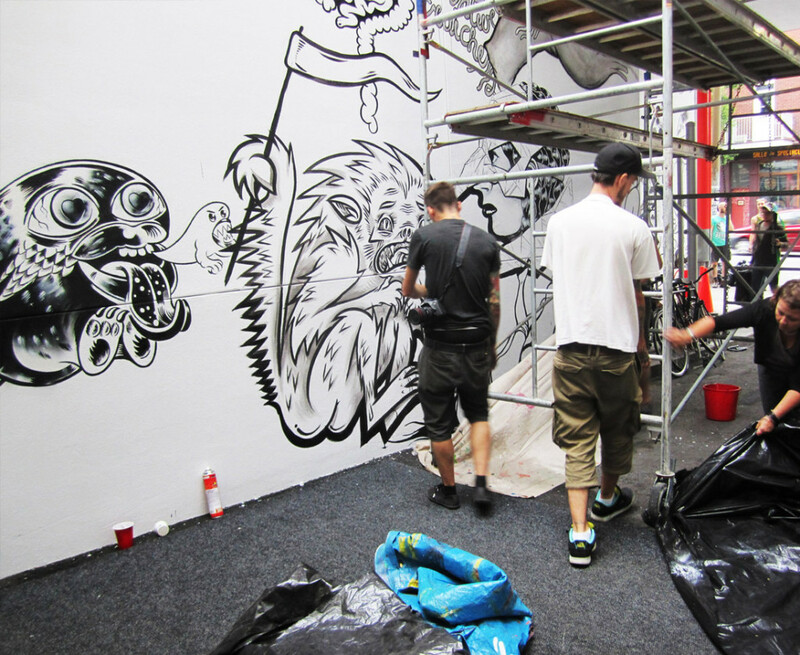 It draws life from the many creative individuals who take part in the project to create large-scale, highly spontaneous drawings in black and white. 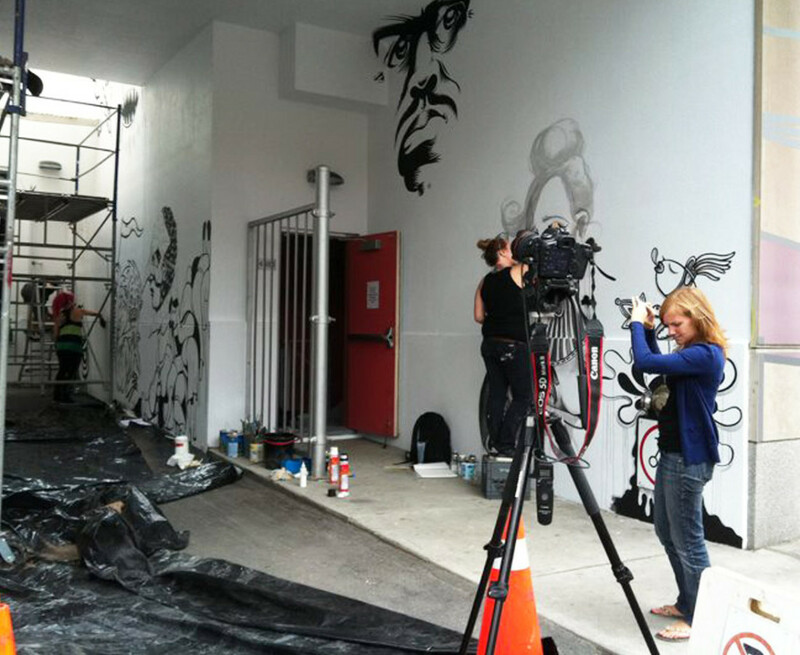 Through Montreal public mural initiative MU and Theatre Espace GO, En Masse was commissioned to paint a huge, immersive, permanent mural in the routinely graffiti-caked loading dock in Mid-August 2011. 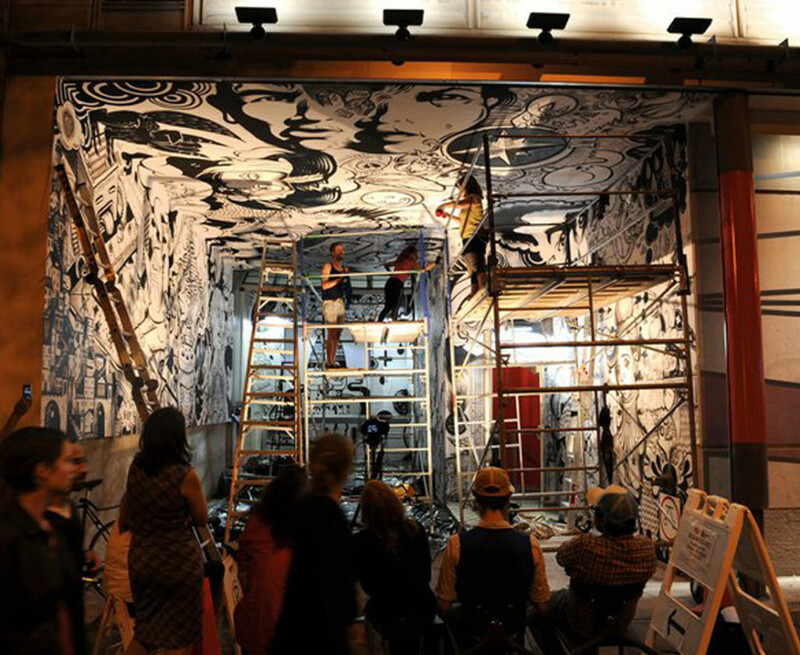 Espace Go is a respected theater and art venue with a mandate to explore and celebrate francophone creations and work by women artists. 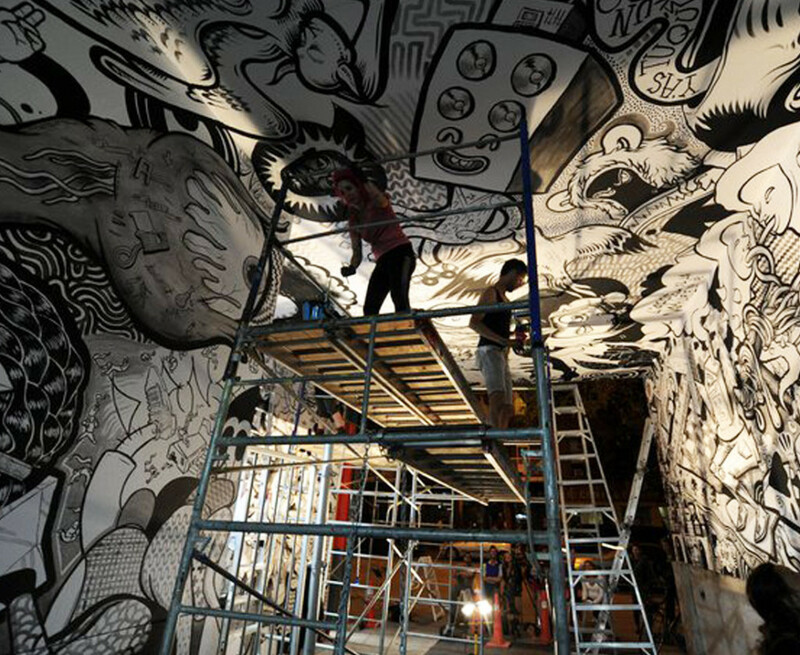 Assembling a team that highlighted women artists on the EM roster without separating them, En Masse brought together Caro Caron, Zema, Mireille Bouchard, Krista Bursey, Peru Dyer, Flexib, Tyler Rauman, Jason Botkin, Frank Lam and Fred Caron, plus a heap of scaffolding, to thoroughly fill the large and, from Boulvard St-Laurent, highly visible space, spilling right up onto and all over the ceiling. 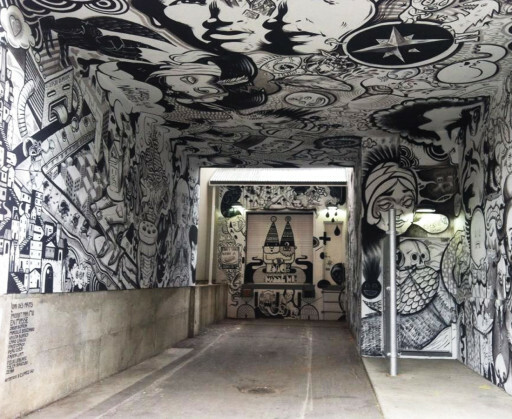 When work was concluded, it was clear that new ground had been broken in terms of what could be achieved by En Masse, and a potent new street-level showcase established for the initiative’s efforts, one which that catch the eyes of Montrealers and visitors by the thousands.